UJR: Hi Meshell, how are you doing?? MN: Pretty good. I'm on Tour, so a little tired, but I can't complain. UJR: It's nice to see you again, I've been a fan for many years. MN: Thank you. I appreciate that very much. UJR: After recently seeing you perform at London's Jazz Cafe, I was just blown away. Your music seems to continually evolve and for me becomes more and more unclassifiable. 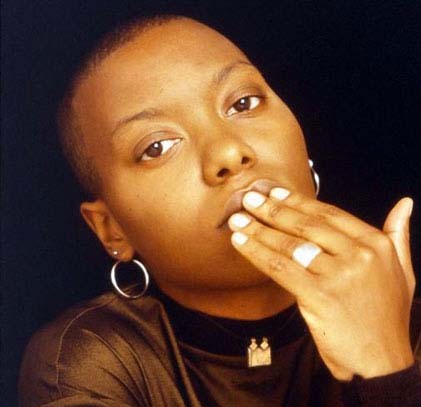 Can you tell us how you feel about the evolution of Meshell Ndegeocello? UJR: That's really interesting, but how did it all begin, how did you first get into the industry? MN: I recorded some demos that fell into the hands of a label executive and I had a few offers, one of which was Maverick. The rest is a much belabored history. UJR: Do you feel that you are growing more into space where your music is hard to define? MN: Maybe. I'm not sure i ever felt that music was supposed to be defined though. Neo-soul is just an invention. I also think that some things I write, like this last record, are rock but that it rarely gets heard or approached as a rock record because people are hung up on what I have made before. It's odd that listeners are able to be eclectic but artists are expected to be singular in their sound or exploration. UJR: Do you feel that your European Fans have a different take on music compared to your Fans in the States? MN: I do. I feel they're more diverse and more willing to come along. UJR: Now for the question everybody would want me to ask, what new projects do you have on the Horizon? MN: I've been producing a few things and I'd like to keep at it. I produced an album for a French artist named Laika Fatien. I produced a track for another French artist, Selah Sue. And I'm writing. Always something new. UJR: What would you say has been the most memorable time during your Career? MN: Probably a bunch of years I can't remember! No, I guess I prefer... No, I work to prefer what is now and not linger on the past so I feel its these years here. The jazz record was memorable. The first record was memorable. I love my band now, so I'm trying to cherish what's right here. UJR: Besides the US & UK, where would you say you enjoyed your greatest success? UJR: Which artist(s) have you had the most fond experience of working with? MN: Oh, so many. Pat Metheny, Chaka Khan, Oliver Lake, Jack DeJohnette. I've really valued every and any collaboration with an artist. But like I said, the artists I play with now are exceptional. And I love working with Bob Power - he's an artist of the mixing variety for sure. UJR: What kind of influence has Jazz in particular had upon your music? MN: My dad played a lot of jazz. Still plays a lot of jazz, so it was an early influence for sure. I think it helped me to appreciate that the band is only as strong as the players. No music transcends mediocre musicians. MN: Decide if you want to be an artist or a star. It's not the same path. UJR: Thanks so much for talking to us, we'd love do it again, it's been really enjoyable. MN: I'd love to, sometime soon!